•Technique: Our office continues to use Chiropractic Biophysics procedures. We no longer have an in house x-rays but can send our patients to the Chiropractic College which uses modern digital x-rays. Biophysics procedures include both osseous, drop table and instrument adjusting to make corrections with an emphasis on structural changes. •Traction: Traction is defined as the process of deflecting tissue. Adjustments alone do not deflect the soft tissue long enough to make changes. We therefore use traction to put enough force to make structural modifications. Think of it as a board being hit over a fulcrum. It will not deflect permanently. Let’s say we took that same board, put it over the fulcrum and put a weight on one end and left it there for some time. This board can and will deflect over time to see a bend that is permanent. Our soft tissue deflects and changes in a similar way. •Vertetrac vs. Decompression: A new procedure utilizing a long axis decompression traction table has been advertised to the public as treatment for many back conditions including herniated disc, fail back surgeries and degenerative disc. This table, while effective for some patients is expensive. Our office has been using the Vertetrac as well as flexion distraction procedures for the past 15 + years. The Vertetrac has some distinct advantages. It is an ambulatory traction device which means you can walk while you are being tractioned. The motion at the same time as traction benefits the effect and can be utilized for all the same things the decom-pression traction table is able to. Cost is dramatically less for our procedure, often included in our normal treatment cost. Decompression procedures often average from $150-200 per treatment. •Electrical Stimulation: One of our primary physical therapy modality used to manage pain and accelerate healing is electrical muscle stimulation (EMS). EMS is capable of deep penetration using interferential stimulation (crisscrossing), or electrical modification to simulate the interferential stimulation. 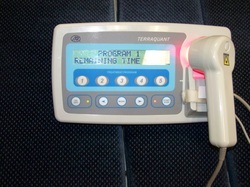 Some of our patients have used portable Tens units that are similar in that they are electrical. The main difference is the penetration. Tens units are used to block pain but rarely penetrate below the skin. This helps to block pain signals to the brain while it is on but rarely has long lasting effects. The inter-ferential current is able to penetrate deeper which allow the effect to touch the source of the pain. 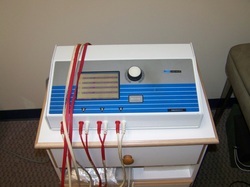 Our EMS is also capable of many different frequencies like micro-current which can also be used for tissue healing. •Low Level Therapeutic Laser: Low level or Cold laser produce a form of light energy when inputted into the cells of our body will convert to chemical energy to promote natural healing and pain relief. It is a safe procedure, causes no cutting or heat production and is used for inflammation reduction, pain relief, antibacterial, increased circulation and accelerated tissue repair. Laser treatment is an attended modality (Requires direct patient treatment) and therefore has a separate charge from our regular Chiropractic fees. Our charges are below what most offices charge for these procedures. We have a brochure that we would be happy to give you. 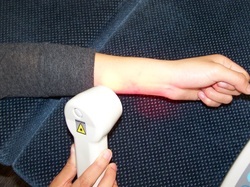 Low-level laser therapy utilizes compressed light of a wavelength from the cold, red part of the electromagnetic spectrum. It is different from natural light in that it is coherent (it travels in a straight line), monochromatic (a single wavelength) and polarized (it concentrates its beam in a defined location or spot). The energy range of low level laser light is between 1 and 500 mW (milliwatts). The surgical lasers have energy ranges 20 to 300 times stronger, which is 3000 to 10,000 mW. These properties allow laser light to penetrate the surface of the skin with no heating effect or damage to the skin or underlying structures. Low level lasers supply energy to the body in the form of non-thermal photons of light. Light is transmitted through the skin's layers (the dermis, epidermis and the subcutaneous tissue) at all wavelengths in the visible range. However, light waves in the near infrared range, penetrate the deepest of all light waves in the visible spectrum. Remember that light is a form of energy. We are basically inputting energy to the skin and the structures beneath the skin. Low Level Laser light directs biostimulative light energy to the body's cells which the cells then convert into chemical energy to promote natural healing and pain relief. Studies have not demonstrated any harmful effects. When low level laser light waves penetrate deeply into the skin, they optimize the immune responses of our blood, leading to both anti-inflammatory and immunosuppressive effects. Scientific studies have shown that light transmitted to the blood in this way has positive effective throughout the whole body. So the effects are both local and systemic. Pain relief experienced with Low Level Laser light appears to be due to increased endorphin release and suppression of nociceptor action. Three effects are widely cited in the literature regarding LLL Therapy. What Are The Effects of Laser Light on Tissue? Laser light causes five (5) actions on tissue, which have been documented as the basis for treatment benefits. They are listed below, summarized from medical and veterinary research articles. Will there be pain with Low Level Laser Therapy? Treatment is simple and painless. It is similar to holding a flashlight close to the skin and shining the light on it. There is no sensation of pain, nor is there an increase in temperature from the laser. Treatment times vary based upon the size of the area to be treated, and the output power of the laser. Most treatments take 5-10 minutes, although the treatment of acupuncture points takes only 1-2 minutes per point.